He is already more than 100 days into his attempt to cycle unassisted through 21 countries around the world – a 18,000-mile (30,000km) journey. Of losing his bike, he said: “You can never quite believe it – I thought maybe someone had moved it at first. He said he had cycled through 17 countries before arriving in Townsville, riding up to 125 miles per day and flying between continents. He estimated that at least (£4,000 ($5,200) in equipment had been stolen, forcing a delay in his plans. Despite the setback, he said he hoped to complete his trip by March – his original goal. 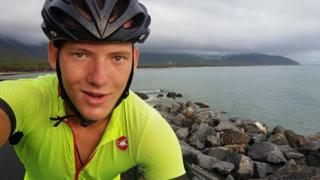 British man Tom Davies is believed to hold the record for being the youngest person to cycle around the world unassisted. He was 19 when he completed his six-month journey in 2015. “This has been the first thing that’s caused me to stop properly,” Mr Condell told the BBC, adding that he had also lost some equipment in India. But he said locals had offered him clothes, accommodation and replacement bikes. “It’s not going to stop me – once I get another bike, I’ll be off again,” Mr Condell said. He added that he would remain a fan of Australia – “although it’s a bit too hot”. Mr Condell, who finished school earlier this year, had originally planned to ride only around Europe during summer. However, he was inspired to take on his world attempt after realising that he could achieve the distance. His next destinations are New Zealand and North America, after which he plans to fly back to Europe to complete his ride in March.